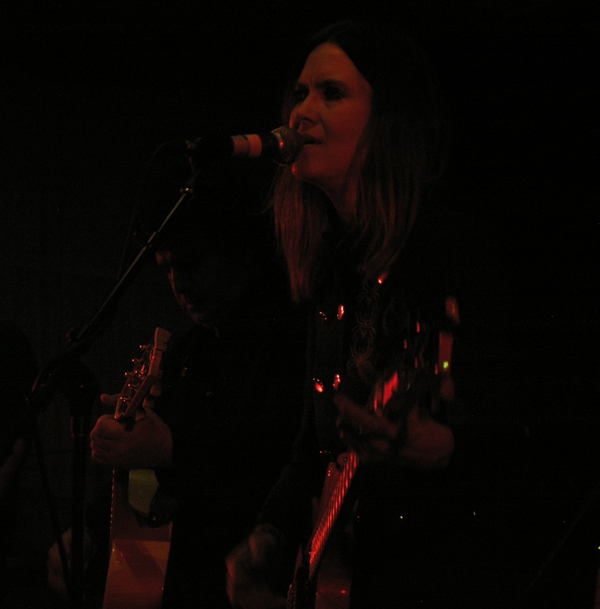 This past Friday night I finally saw the legendary Juliana Hatfield – one of my favorite artists – in concert. Being a fellow Masshole (slang for Massachusetts resident), I should’ve seen her years ago. I’m honestly not sure why I didn’t. I’m sure I wanted to and there were just family or other obligations that prevented me. 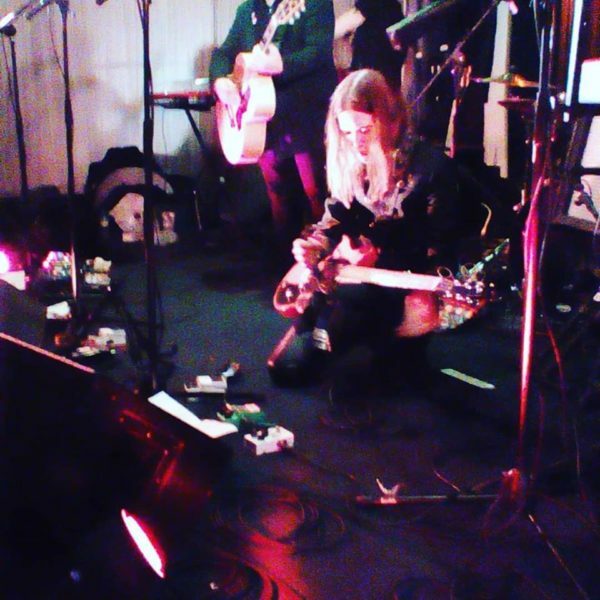 In any case, my dream of seeing her live finally came true at ONCE in Somerville (156 Highland Ave, Somerville, MA) this past Friday night, the 6th of April, 2018. 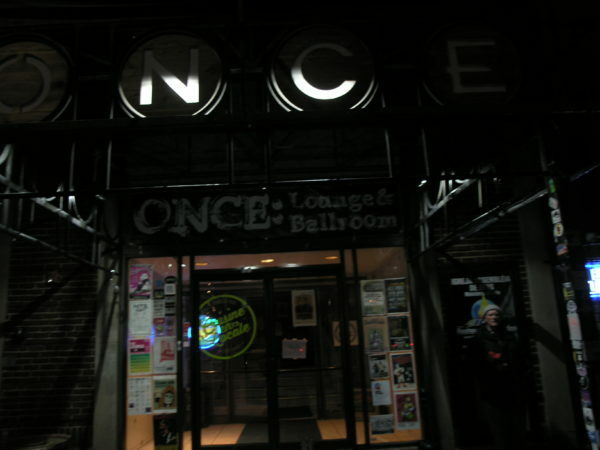 It was actually my very first time going to a show at ONCE and I really enjoyed their venue. It was warm and inviting. It was also spacious and had a great concert club vibe to it. Just one of those halls you’d enjoy being at even if you weren’t crazy about whoever was performing. 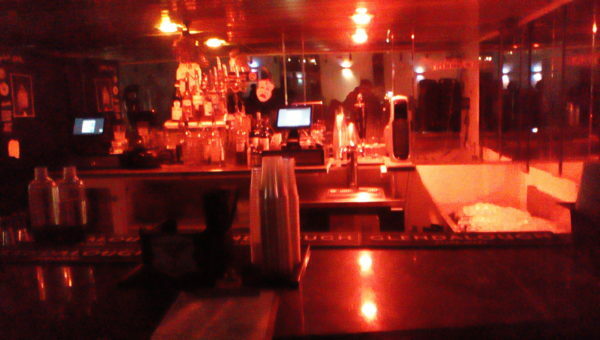 They also had a fully stocked bar, which I had a couple of drinks from. The first was vodka and cranberry juice. The bartender recommended a brand of vodka I’m not familiar with, but I went with it and it was mighty tasty. Later, I had a Monkey Wrench, one of the house’s own creations, which I believe had vodka. What I remember most is that they mixed it with this delicious, fancy-looking orange mandarin stuff. I need to ask them where they get it so I can buy some for at home. Now, where some venues in the Boston area feel over-crowded or they’re not very clean, I never felt cramped at ONCE and found the venue to be very clean. The men’s restroom has stickers all over the place, which is something I love to see at clubs. If I see one for a band whose logo I’m impressed with, I might look them up on Spotify when I get home. In any case, aside from that the restroom was in great shape with stalls that actually still lock and no foul odors. Not when I arrived anyway; I’m sure there were times after that when the smell wasn’t so pleasant. Like any restroom anywhere. 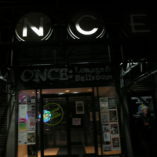 However, I visited it again at the end of the show, expecting it to be a disaster because that’s always how it is after shows. To my surprise, it was still fairly clean, this at the time when you often find restrooms post shows to be a filthy mess. So, I’m assuming someone kept an eye on the restroom and cleaned it up at some point during the show. Or maybe there were just very considerate people attending the show and they kept it that way. One never knows. I should also mention that they have their own parking lot and that it’s free to park there. I’m sure it must fill up by the time a show starts, but if you get there before doors open then I should think you’d find a space there. If you’re interested in visiting the lounge and bar part of the venue, it’s open from 6pm-1am. In any case, I’ll definitely return to ONCE in the future. I need to see more local artists to feature in Love is Pop and it looks like that is their specialty from what I’ve seen on the calendar. I should also mention that every Tuesday nights at the club are “Heavy Metal Tuesdays.” From the impression I get from the ads, I suspect that this is more of a death and black metal crowd than an old school heavy metal crowd who’d want to hearsay, Poison or Pretty Boy Floyd, than Watain and The Agonist. If I’m mistaken, they can let me know and I’ll correct this. Up first Friday night was Abbie Barrett, who shared not only the stage but the band with Juliana that night. I’m not sure if it was Juliana’s band doing Abbie a favor or vice versa. It’s also possible that the band was comprised of members of both bands. I’m sure I’ll find out when I interview Abbie soon. 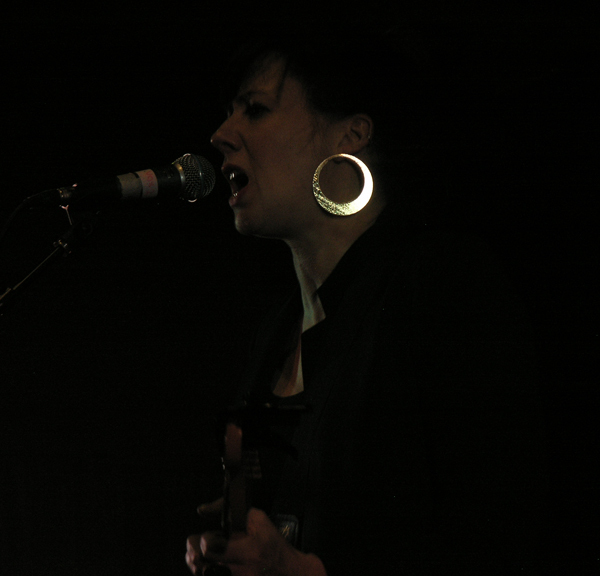 In any case, Abbie was a magnetic frontwoman, captivating anyone who so much as glanced at her. I suspect that it had less to do with the fact that she’s beautiful than it had to do with the fact that she’s one hell of a singer/songwriter. At times she reminded me of The Pretenders’ Chrissie Hynde. During others, I swore I was looking at Joan Jett up there. So, I suppose I’d say that Abbie’s music was like a cross between the two, her songs chock full of just the right amount of rock goddess attitude and killer hooks. I’ll definitely be listening to a lot of her alt-rock music soon and not just to prepare for the interview. 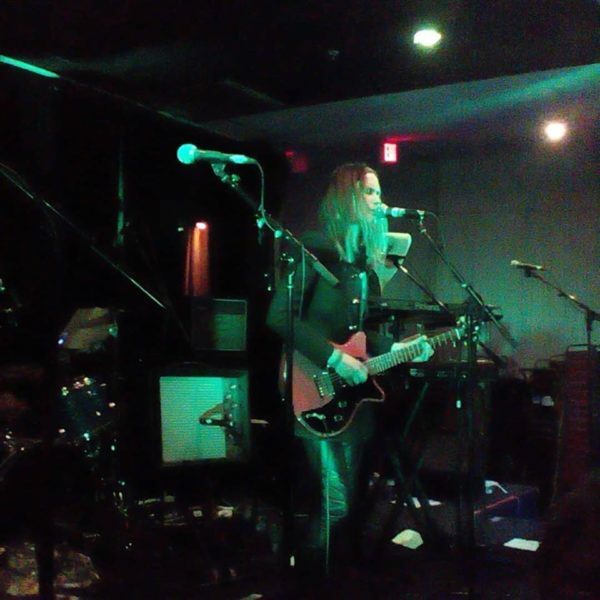 Juliana Hatfield went on around 10P.M. if memory serves me correctly. I’m not positive because I spent much of the night focused on taking photos. Unfortunately, it turns out the professional camera my friend let me use doesn’t not take photos well without flash. Unless, you know, you’re outside or somewhere with a ton of light. At the Gabriella Aplin show about a month ago, I was able to get some great photos because the stage was very well lit. The lighting at ONCE was perfectly fine, mind you. They just don’t throw as much light into the performers’ faces, which I’m sure is a kindness paid to their artists. The only downside was that I took nearly 200 photos and none of them came out useable. They’re all so dark you can barely see anything on the page. Fortunately, I took some photos with my Kindle so I at least have those. Insofar as how a Kindle can take fine photos in the dark and a professional camera can’t, well, I wish I was tech savvy enough to give you a good theory about that. But I digress. Back to Juliana. As she sang the word “failure” over and over during that opening track, I found myself questioning whether or not I’m a failure. But I deduced that I’m not because I have a popular music blog, unlike most people. Anyway, I wasn’t deep in thought about this. It was just something that bounced around in my head for maybe 90 seconds as random thoughts do. 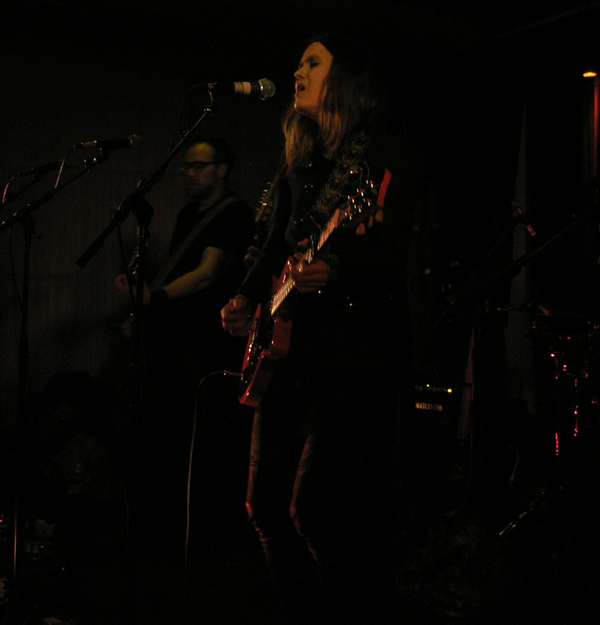 Next up was “If I Could,” which is one of my favorite songs from The Juliana Hatfield Three’s 2015 album Whatever, My Love. I wasn’t sure if she was going to perform anything by the band, or if she’d just stick to the songs that she’d done strictly as a solo artist, so I was delighted to hear her launch into one of the Three’s songs so early in the set. 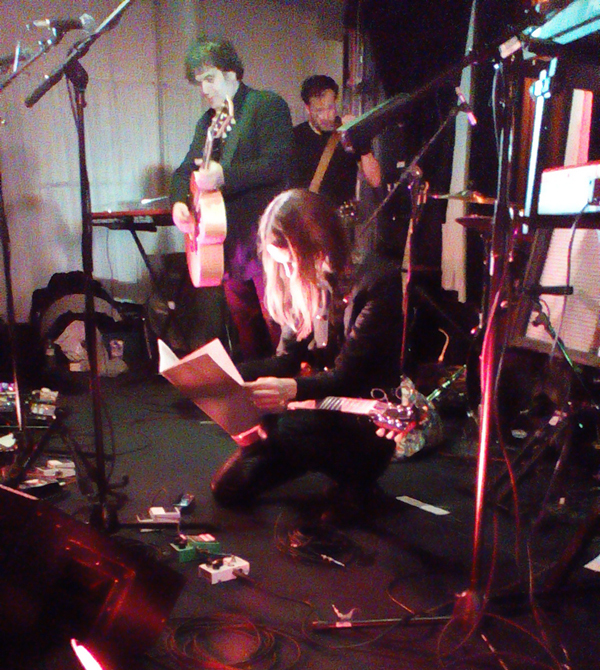 And, yes, it had more of an edge live, particularly in terms of the guitar tone. “Somebody Was Waiting for Me” followed, the song hailing from the album Beautiful Creature. I knew that one very well as I met Juliana at a signing at Newbury Comics’ Harvard Square location back in 2000 when the album came out along with a band album called Juliana’s Pony. They were released as a set, though you could also buy them separately. I think everyone who was at the show had a great time. Juliana looked like she was having fun, too. Sometimes she’d look so serious you’d swear she was going to jump out into the audience and smack you, but mostly she looked like she was having the time of her life. The only people who might’ve gone home unhappy would’ve been people who dislike Olivia Newton-John and had no idea what they were in for. I wish I would’ve been at that show! Sounds like it was a great one.